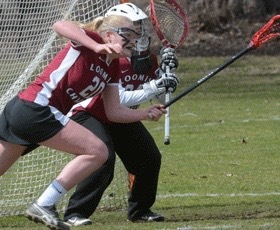 The Loomis girls lacrosse program has a long-established tradition of excellence. Over the past 20 years, the varsity team has consistently finished among the top teams in New England, winning the Founders League in eight of the past 10 years and ranking as high as No. 8 in the nation according to Lacrosse Magazine. It’s an exciting time to play lacrosse at Loomis as our program gets stronger year after year and we are always looking for good athletes to come in and continue our tradition. We value the gifts that multi-sport student athletes bring to the program. With many of our student athletes earning All-American honors and a long list of Division I and Division III alumnae from our program, we are especially proud of our players who have gone on to captain their college and university teams over the years. The U.S. Women's Lacrosse National Training Team on Wednesday, October 24, released its roster for the President's Cup in Lake Buena Vista, Fla., and Emma Trenchard '17 was named to the team. With a 15-5 win over Kent on Wednesday, May 23, the girls lacrosse team defended its Founders League title and recorded an undefeated season in the league while also celebrating the team's seniors, who played their final game at Loomis Chaffee. Emma Trenchard '17 and the rest of the University of North Carolina women's lacrosse team won the Atlantic Coast Conference Tournament championship on April 29, and Emma was named to the All-ACC Tournament team.